For examination in June and November 2020, 2021 and 2022. Also available for examination in March 2020, 2021 and 2022 for India only. curiosity and a lasting passion for learning. We are part of the University of Cambridge. delivering high-quality educational programmes that can unlock learners’ potential. learners to progress from one stage to the next, and are well supported by teaching and learning resources. who are confident, responsible, reflective, innovative and engaged – equipped for success in the modern world. an international education from Cambridge International. the University of Cambridge Local Examinations Syndicate (UCLES), which itself is a department of the University of Cambridge. internal use within a centre. For information about changes to this syllabus for 2020, 2021 and 2022, go to page 27. 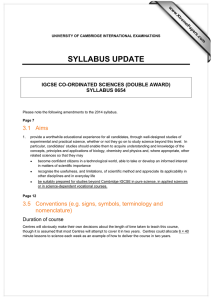 The latest syllabus is version 2, published December 2018. 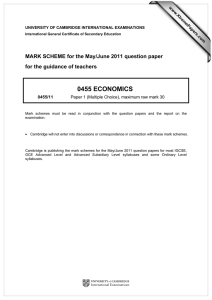 Cambridge IGCSE Economics 0455 syllabus for 2020, 2021 and 2022. 1 Why choose this syllabus? of schools and for learners with a wide range of abilities. •• an excellent foundation for advanced study in economics. learners need for their next steps in education or employment. 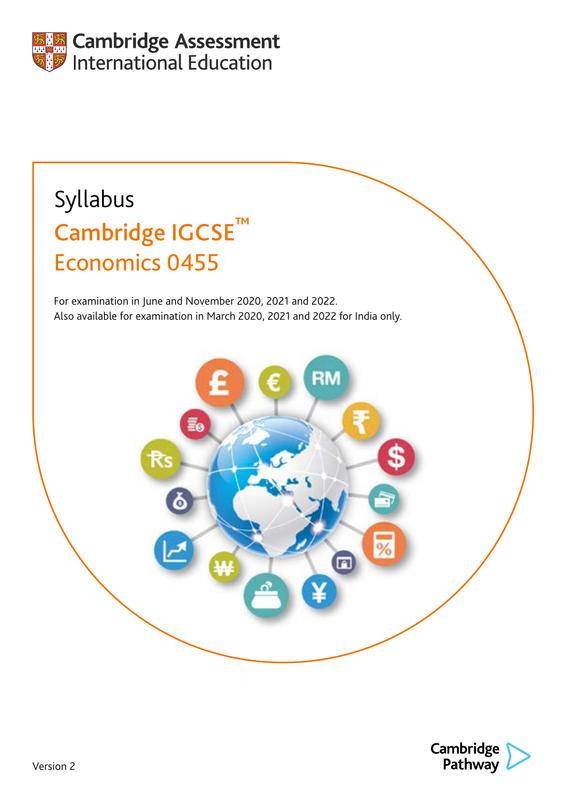 Cambridge IGCSE Economics 0455 syllabus for 2020, 2021 and 2022. Why choose this syllabus? Cambridge International AS & A Level Economics, or the equivalent. 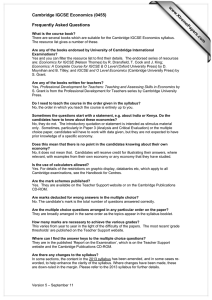 Cambridge IGCSEs or equivalent to meet their entry requirements. are accepted as equivalent to UK GCSEs by leading universities worldwide. development so that you can give your learners the best possible preparation for Cambridge IGCSE. 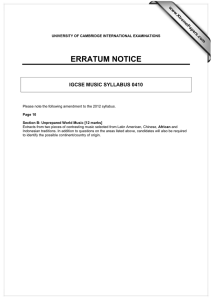 The aims describe the purposes of a course based on this syllabus. They are not listed in order of priority. •• apply economic understanding to current economic issues. the core of this section. the major decision makers: banks, households, workers, trade unions and firms. on development in a variety of countries are explored. opportunity to connect with each other and to ask questions related to the syllabus. All candidates take two components, Paper 1 and Paper 2.
and three questions from a choice of four. •• analyse economic issues and situations, identifying and developing links. •• communicate economic thinking in a logical manner. The approximate weightings allocated to each of the assessment objectives (AOs) are summarised below. The influences on the mobility of the various factors. and governments when allocating their resources. The significance of the location of production points. Movements along a PPC and opportunity cost. terms of an economy’s growth. – what to produce, how, and for whom. equilibrium price and sales in a market. consequences for equilibrium price and sales. the significance of the result. diagrams to show different PED. monopoly power and factor immobility. market failure are not required. exchange markets; indirect taxation; and subsidies. nationalisation; and direct provision of goods. The forms, functions and characteristics of money. – between different households and over time. employment; and influencing government policy. Factors influencing the strength of trade unions. private/public sector, and the relative size of firms. structure of a firm is not required. Internal growth, for example increased market share. External growth, for example mergers. the scale of production changes. production and their advantages and disadvantages. Note: marginal cost not required. Calculation of TC, ATC, FC, VC, AFC and AVC. Total revenue (TR) and average revenue (AR). Note: marginal revenue is not required. Calculation of TR and AR. The influence of sales on revenue. competition and diagrams are not required. Note: diagrams are not required. of payments stability, redistribution of income. that governments set for each aim. reasons for and effects of spending in these areas. and the reasons for levying taxation. The qualities of a good tax. government and economy as a whole. policy, that cause budget balance or imbalance. government to achieve its macroeconomic aims. work and invest, and privatisation. movement from inside toward the PPC. growth and how effective they might be. Frictional, structural and cyclical unemployment. individual, firms and the economy as a whole. unemployment and how effective they might be. Causes of inflation: demand-pull and cost-push. Causes of deflation: demand-side and supply-side. deflation and how effective they might be. The components of real GDP and HDI. income distribution within and between countries. The difference between the two terms. progressive taxation, and national minimum wage. required, but drawing is not. For consumers, firms and the economy. economy in a variety of countries. Tariffs, import quotas, subsidies and embargoes. industry and avoidance of dumping. home country and its trading partners. the equilibrium foreign exchange rate. entry or departure of MNCs. and exports via the PED. and a fixed foreign exchange rate system. services, primary income and secondary income. Reasons for deficits and surpluses. payments stability and how effective they might be. For information on the assessment objectives (AOs), see Section 2. Candidates answer one compulsory question in Section A and three questions from a choice of four in Section B. Candidates write their answers in the answer booklet provided. Candidates should be aware of the marks for each part question. These are printed on the question paper. Calculators may be used in both sections of the examination. examples that they have studied. will relate to the subject context. We do not expect learners starting this course to have previously studied economics. may vary according to local practice and their previous experience of the subject. Private candidates can enter for this syllabus. •• syllabuses with the same title at the same level. Cambridge IGCSE, Cambridge IGCSE (9–1) and Cambridge O Level syllabuses are at the same level. Entries. Your exams officer has a copy of this guide. candidates cannot re-sit individual components. advantage over others or if they compromise the standards being assessed. parts of the assessment they have completed. 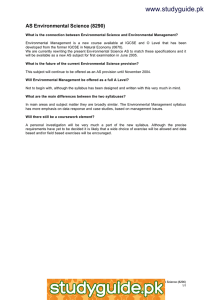 This syllabus and the related assessment materials are available in English only. Grades A*, A, B, C, D, E, F or G indicate the standard a candidate achieved at Cambridge IGCSE. These letters do not appear on the certificate. Assessment at Cambridge IGCSE has two purposes. •• To measure learning and achievement. the syllabus, to the levels described in the grade descriptions. •• To show likely future success. –– help students choose the most suitable course or career. performance in some other aspect. •• Brief guidance about the scope of each topic is included (see Section 3). •• A Command Words glossary is included (see Section 4). •• Assessment objectives AO1, AO2 and AO3 are updated (see Section 2). 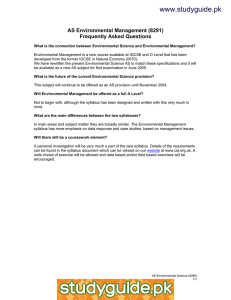 •• The assessment objective weightings are updated (see Section 2). •• The syllabus aims are refreshed (see Section 2). the assessment and the syllabus content. In addition to reading the syllabus, teachers should refer to the updated specimen assessment materials. You are strongly advised to read the whole syllabus before planning your teaching programme.